“This necklace brings together and mixes various prayer-necklaces, which only differ in detail. Prayerbeads are being used in several religions and they all have their own systematical design. The beads stands for the different prayers and by following the beads you can count and can’t loose track while you are praying. The Roman-Catholic church has the ‘rosary”, the Islam has the “tespi”, Buddhism (Nichiren) has the “juzu” and Tibethan Buddism has the “mala”. Nowadays we are living in a time of globalization. Worldwide people are connecting more and more, not only economically, but also politically and culturally. Borders are fading and people travel and migrate more than ever. Out of that comes integration of different cultures and religions. Partly because of the not always so very successful integration-policy of many countries, extremism in certain religions also flourishes, conflicts arise. With my interpretation of the prayer-necklace I want to bring together all prayer-necklaces and make 1 out of it all. 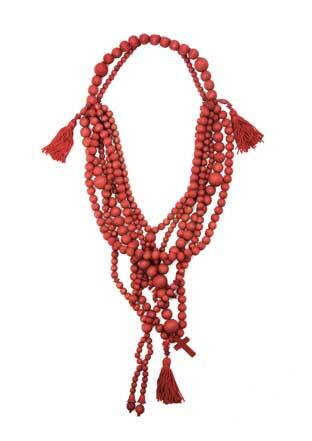 A contemporary blood red prayer necklace. In my opinion the religions don’t differ so much from one another, they differ mostly in details. That’s what I want to show with this necklace. By bringing together all the prayerbeads, symbolically I want to bring together the different religions and with that the people. The title “Bound by Blood” stands for the idea that on the inside we are all the same.